Newtonator (ver. 0.6.0 shown above) is a 3-note polyphonic software sound synthesizer in LV2 plug-in format, created by Michael Bechard, and with a unique approach to sound synthesis. It can run within a DAW such as Qtractor, or the Carla plugin host. It consists of the two main GUI pages: a Main page and a Gravity Modulation page. It is included in various linux distro repositories, although it can be downloaded at Sourceforge at the link at the bottom of this page. 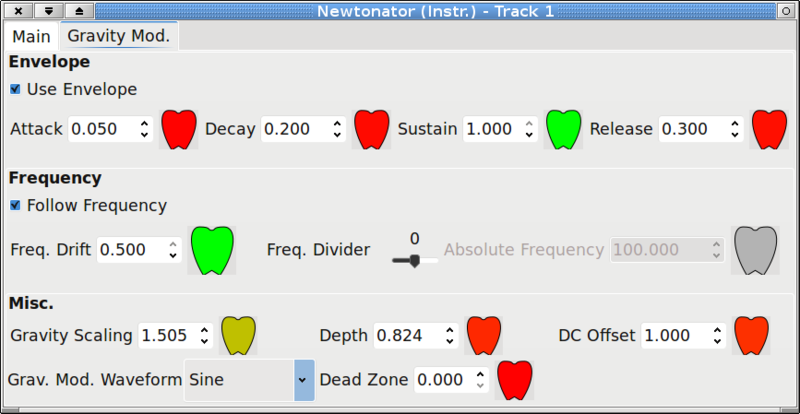 According to the webpage, "The Newtonator is an LV2 soft synth that uses a unique algorithm based on simple ideas of velocity and acceleration to produce some unpredictable sounds." Rather than thinking of sound in terms of waveform, The Newtonator is designed to think of sound as a ball in movement between ceiling (aliasing point, or Nyquist number) and floor, with all the possible modifications given for such an environment, such as gravity intensity and gravity modulation, etc. The webpage at Sourceforge has two brief "manuals," both very useful: a technical description of Newtonator's synthesis approach (which also describes some parameters not available in version 0.6.0, such as Floor Modulation), as well as a more simplified "quick start" description. The parameters can be modified either by changing the numerical values or by mouse-dragging on the apples. The apples change color based on value intensity. A standard ADSR envelope section for amplitude is shown at the top of the Main page, along with overall volume level. The "Clip Wobble" section controls what will happen when notes approach clipping. "Scale" parameter controls overtone strengths, as do parameters "A" and "B." There is also a Timbre control. The Velocity section controls the "movement" of the sound. These parameters will help make the sounds more or less "musical," and if you are not getting sound out, try modifying these parameters. The Miscellaneous section has three settings: Ext. Clip, Int. Clip and Bounce. 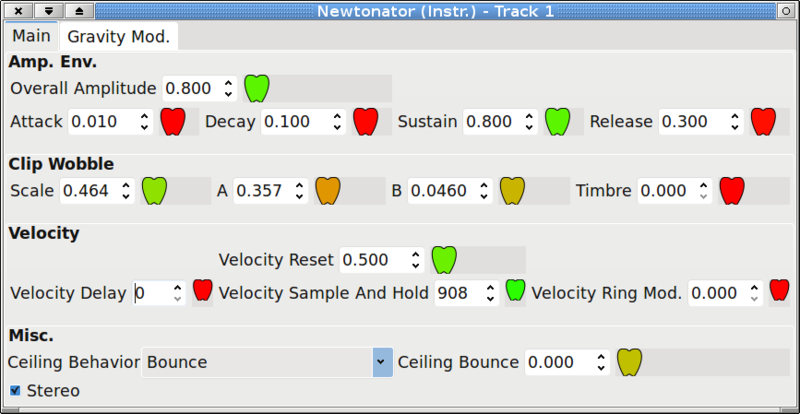 Selecting Bounce will give control of the "Ceiling Bounce" parameter. The Gravity Modulation page includes an Envelope section and a Frequency section, both which are activated if the Depth control in the "Misc." section is adjusted. The Envelope section (when activated) will control the gravity modulation signal. Frequency Drift and Frequency Divider both affect the scaling of the initial frequency. Drift is more slight modulation, whereas Divider is in octaves. Absolute Frequency can be used as an alternative, and can be set to hold and fractional numbers. The Misc. section of the Gravity Modulation page includes a Gravity Scaling parameter, which scales up the amount of "gravity" relative to how far the "ball" is from the "floor." There are 5 Gravity Modulation Waveform possibilities: Sine, Saw, Square, Impulse, Noise.